A poem game so lovely as a tree. Hm. Maybe I’ll leave the poetry to Kilmer. Moving on…. Most people know that photosynthesis has something to do with plants and leaves and the color green. Now it also has to do with a cool game called Photosynthesis. 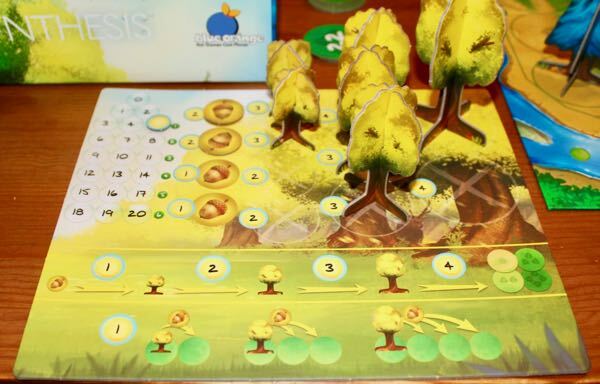 Photosynthesis the game is about growing and harvesting your type of tree – blue spruce, oak, maple, or (probably) linden – faster and more efficiently than everyone else. Photosynthesis has some awesome and gorgeous game bits. The most obvious of these are the 3D trees that you can see in the picture above. They come “pre-slotted” so you just insert the trunk end of one piece into the crown (top) end of the other. Most of the time, the pieces stay together just fine. For some reason (probably tiny differences in production machining), some of the trees tend to fall apart once in a while. This isn’t a big deal, since the way you normally handle a tree makes it stay together just fine. The main board has circles for placing your trees (and seeds). These circles are arranged in three hexagonal rings showing 1, 2, or 3 leaves. There is also one central circle showing 4 leaves. The number of leaves determines which scoring pile you will get a points token from when you harvest (remove) your tree from the board. The closer to the center, the more points you’ll generally score. 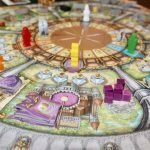 The other main bit is the sun arc, which you can see at the top of the game board in the photo above. You move this piece around the six points on the board to indicate the direction of the suns rays and as a timer for the game. 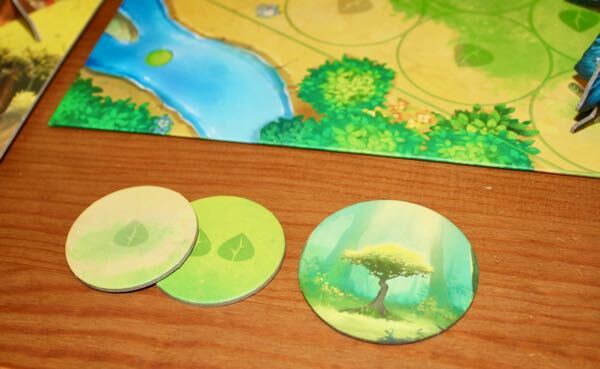 Below is a player board which is the same for each player, except that it is themed according to the type of tree you are using. At the upper left of this board is a “light points track” that tells you how many action points you can spend each turn. You use a tiny sun token for tracking these points. To the right of this is a storage area for your seeds and three sizes of trees. By each of these items is a number indicating how many light points it takes to “buy” each item. At the bottom are two informational tracks that tell you how much it costs to grow (and harvest) your trees and where you can plant new seeds (from your existing trees) on the main board. This information is the same no matter which type of tree you are playing with. 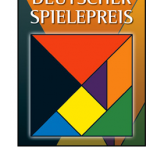 The only other bits are the scoring tokens shown just below and the start player token shown further down. Note that these circular tokens have leaves in counts that match the circles on the main board. Usually, tokens underneath the ones on the top of the stack are worth fewer points. The start player token, which is passed to the left each round, shows the same type of tree as is pictured on the cover of the box. It may be a baobab tree. Note that the directions I give below incorporate the “advanced” rules. I don’t consider playing without them to be worthwhile. 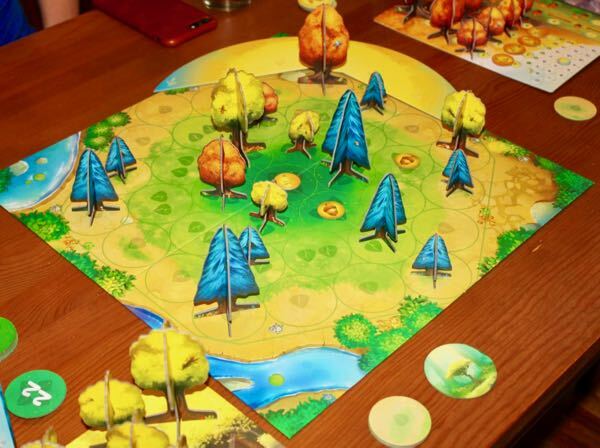 At the start of the game, each player has zero light points, a full complement of seeds and trees on his player board, plus 2 seeds, 4 small trees, and 2 medium-sized trees on the table (which have already been purchased) ready for placement on the main board. Before the first round, players take turns placing 2 of their small trees wherever they like on the outer hexagonal ring on the board. Then, they collect light points from those trees on which the sun is shining. A small tree gives you 1 light point. If another tree is immediately in front of yours; that is, just one space away in the direction of the sun’s rays, it is in the shade, so you would not collect any light points from it. In general, if your tree is taller than those in front of it, it is not in the shade and so will collect light points. If your tree is the same height or shorter and is close enough to a tree in front, then it is in the shade – no light points. Small trees cast 1 circle of shadow; mediums cast 2; and large trees cast 3. Thus you can be 4, 5, or 6 circles (in a straight line) away from even a tall tree and still get light points. Small trees give 1 light point; medium give 2; large give 3. You can spend light points to plant new seeds. These seed come from existing trees on the main board. You can plant them 1 circle away from small trees, 2 from medium, and 3 from large. 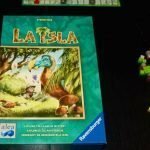 You also spend points to grow trees – 1 point to grow a seed into a small tree, 2 points to grow from small to medium, and 3 points to change a medium into a large tree. It costs 4 points to harvest a large tree and collect the corresponding points token from a stack. You can only “activate” a circle on the main board once per turn. This prevents players from monopolizing a given circle. For example, you can’t both harvest a tree and plant a new seed on it in the same turn. The game ends after the sun has gone around the board 4 times. The player with the most points on their harvested-trees tokens (plus 1 point for every 3 leftover light points) is the winner. 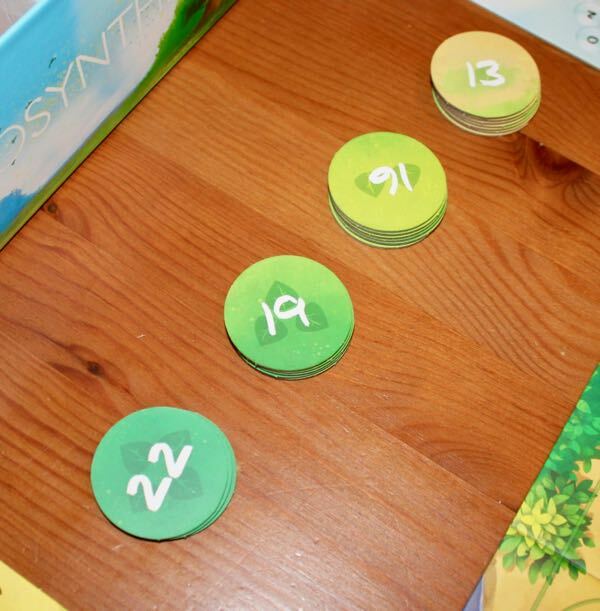 Photosynthesis has the unusual mechanism of the sun movement which will determine where you can play each turn. Player turn order can make a difference too, especially if someone else grows a tree to put your tree into the shade when it hadn’t been at the start of the round. I really enjoy the puzzle of deciding which spaces to plant or grow trees on. You have to decide how to get the most light points, how to prevent your opponents from getting too many light points, and which spaces to take over just for defensive purposes. You might at first think that the center, 4-leaf space is the best, but then you realize that most of the time it’s going to be in the shadow of the other trees. You might at first think that you’ll always win by harvesting the most trees on the 3-leaf inner circles, but I recently played a game (see the picture above with all the blue spruce trees) where the winner got almost all the points tokens from the 1-leaf stack. It seems that the winner will normally be the one to harvest the most trees, no matter which spaces they come from. Yet harvesting is a balance between getting a lot of light points from your bigger trees while they’re still on the board versus collecting victory points tokens from actually harvesting them. Having smaller trees in the right places where they can gather light points is important too…again, see the blue spruces above. This is a game that would really benefit from a deluxe version. 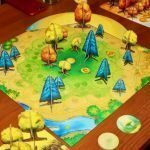 The trees could be actual replicas of real trees, instead of slotted cardboard pieces. If the sun could actually shine (properly!) on the board, that would be awesome! Seeds shaped like the real thing, instead of cardboard circles, would be neat. Even without such bit improvements, this is a great game. It probably plays best with 3 players. With two, there’s too much open space, and you don’t have the fun confrontation that’s there with more people. 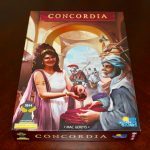 Four players can make the board really crowded, but it’s still manageable. Check out Photosynthesis at Amazon now.